The Sand-Off! Sand Wipe Off Mitt in Blue is the latest innovation from a brand that understands the importance of getting the absolute most out of your trips to the beach. 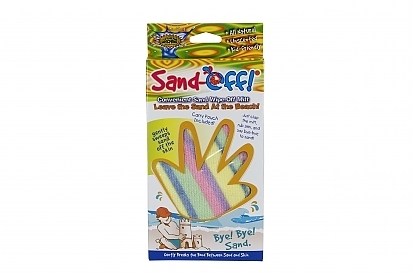 Wipe-Off Mitts are incredibly convenient additions to any trip and offer an entirely accessible way of removing any pesky sand from your skin. Our Mitts feature a patented formulation that provides an all natural and talcum-free way of swiping away sand. The simple process of clapping your Mitts together and rubbing your skin will remove any unwanted sand from interfering with your fun at the beach. The plush terry cloth applicator was specifically designed to offer the softest and gentlest experience. The cloth carries the additional bonus of working atop of suntan lotions and perspiration. Recommended for all ages, Sand-Off! Sand Wipe Off Mitt in Blue is a must own accessory that complements any trip to the beach. Convenient way to wipe off sand from your skin. 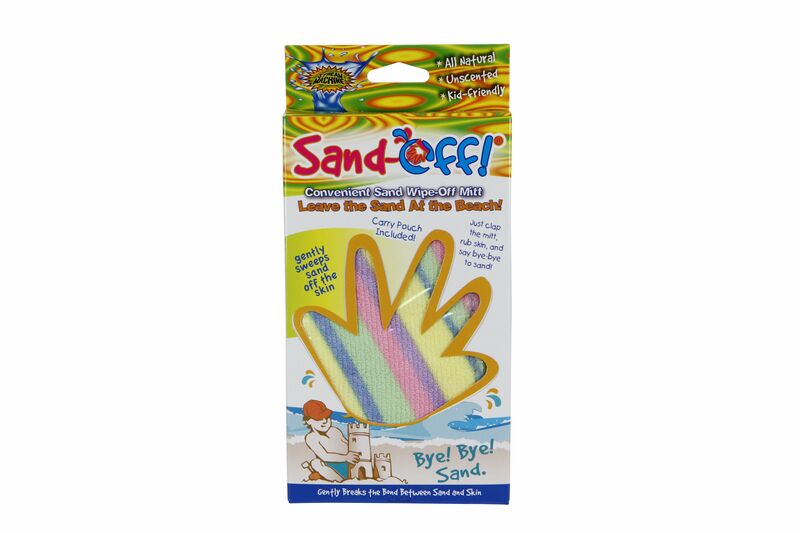 Contains a patented, dry body wash powder formulation embedded in the mitt to remove sand with no mess. Simply clap the mitt, rub it on your skin and say bye-bye to sand. Plush terry cloth applicator is gentle to the skin. Works with the presence of suntan lotion and perspiration. Portable and travel friendly - carry pouch included. Perfect for beach events, vacations, beach volleyball, sandboxes, anywhere there is sand!